Duck Dynasty’s Si and Jase Robertson have teamed up with insurer State Farm to reinforce the importance of turkey fryer and cooking safety this holiday season with a brand-new video titled Hang on a Minute with Jase and Si Robertson. The video captures the importance of turkey frying safety in a humorous yet educational way by cautioning viewers to “hang on a minute and think before you fry”. Regardless if the person frying the bird is experienced or a novice, everyone should take appropriate safety precautions prior to frying. 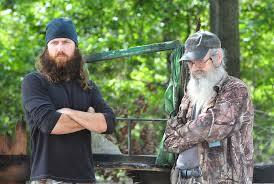 Jase Robertson and Uncle Si have been frying turkey for years without incident because they recognize the dangers and take the proper safety measures to reduce their risk of a fire. Cooking fires are the number one cause of home fires and home injuries. Based on data from State Farm, more cooking fires occur on Thanksgiving than any other day of the year. The good news is that State Farm cooking fire claims on Thanksgiving Day have been reduced from 66 claims in 2010 to 29 claims in 2012, the lowest number of claims in a decade. While the reduction is significant, the fact remains there are still injuries and damage to property as a result of turkey frying or cooking fires each year.